Set of 4 tumbled marble coasters. 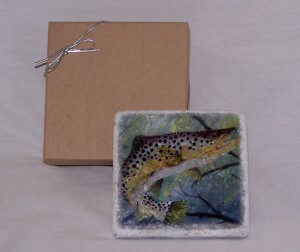 The coasters feature a painting of a Brown Trout. They have a cork backing and come in a brown paper gift box. Tumbled marble coasters with Brown Trout.